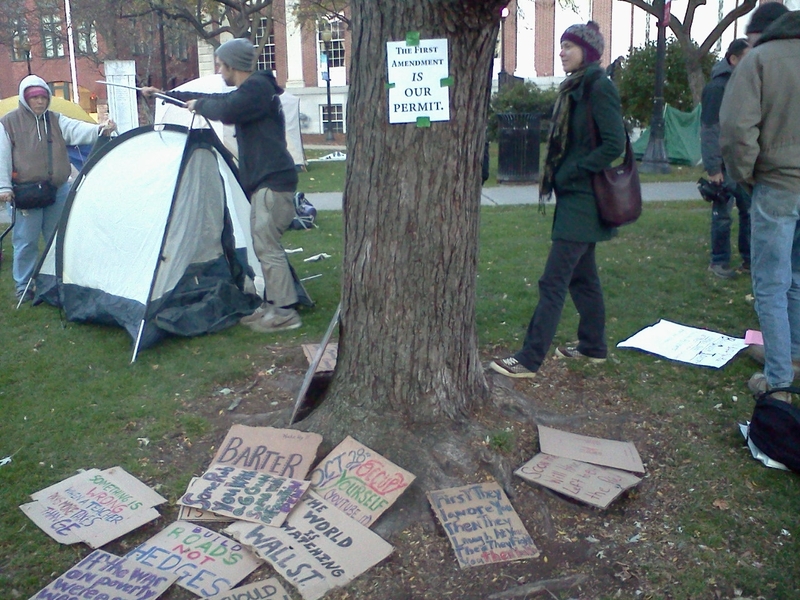 I was at the Occupation of City Hall Park in Burlington this evening, on the seventh day of the occupation. I was talking to one of the coordinators who was saying that he didn’t realize how much work went into doing this. All of the logistics, getting people to follow standards, keeping people fed and getting rid of recycling. But spirits were high. For those of you who don’t understand why these permanent occupations are important, let me explain why I think they are. In 2002 and 2003, we made numerous trips from Atlanta to DC or New York for anti-war rallies to try to stop the invasion of Iraq. The trip to New York for the February 15, 2003 world-wide rally was incredible. We were part of more than 200,000 people who jammed the streets. But then we got in our cars or buses and went home, and a month later the invasion began – and we all know how well that turned out. So, the point of the occupations is to let the powers that be know that we’re not going anywhere. We’re not just here for one day – usually on a weekend, so as not to disrupt much – and then we’ll go home. That you’re going to have to walk past us or see us everyday when you’re on your way to work. We tried it the other way, and it didn’t really make a difference. I have spent a lot of time reading and listening to information about the Occupy Wall Street Movement. Amy Goodman and Democracy Now! have done an excellent job of covering what is happening. On the other hand, I received a subscription to Time magazine this year. The last issue did not have ONE piece of information about OWS. I guess they think that if they ignore it, it will go away. If you want truthful information about what is happening, the mainstream news isn’t going to give it to you. I found the Occupy the Airwaves podcast in iTunes. It is done by a guy who works in radio in the Bay Area, who wasn’t sure what this Movement was about. He decided to go to some of the rallies with a microphone and talk to the people there. Most of the interviews are with people who don’t normally go to rallies, but understood they had to do something, so they came and found they felt empowered and energized. If you’re not sure about this Movement, or even if you are, give these podcasts a listen. They are very well done. Another podcast I found was the Moment of Clarity done by a comedian named Lee Camp. These Moments have a bite to them and are extended rants – not necessarily humorous. He doesn’t mince words – or always use PG-13 language – but they’re worth a listen. I’ll share more later as I find things. 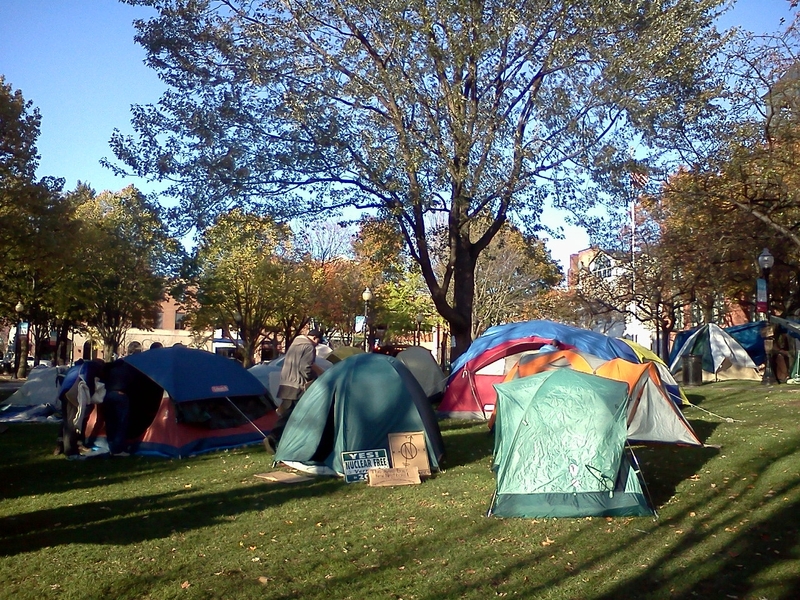 In the meantime, find an Occupy (Your Town or State Here) near you and find out more – and get involved.